People who eventually marry meet in numerous ways. Could be in school or a blind date. In some countries, the couple is selected by the parents. In 1982, good fortune smiled upon Lynne and Jeff. Both had come to the Fargo gathering place to meet a few friends. Both had dates with others. During the evening, Jeff’s interest in Lynne increased, and he would then ask her for a date. Now they can retell of a great night when they met in a North Dakota bar. A courtship of over three years ensued, partially because of the thumbs up and thumbs down by parents. The wedding was in 1986. Both having prior spouses, there were four children. Now that has grown to eight grandchildren, three great-grandchildren and another due at any time. 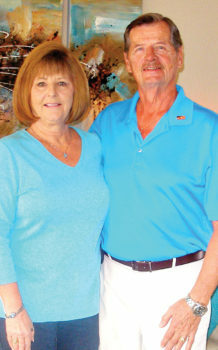 Lynne and Jeff Carlson are family oriented, not only with their current one but also with parents and siblings before. Lynne, born in Winnipeg, has memories of her mother, a nurse and vice president of the hospital there. Perhaps the example led Lynne to North Dakota Southern University where she finished with a BS nursing degree and the beginning of a long love affair of helping patients in the medical field. “I just loved my work and was so blessed by God.” She began in radiology and soon became a radiation therapist, retiring 35 years later. She relates many of her experiences and exudes excitement as she speaks of her patients and work. Jeff’s family has a four-generation linage of serving in the military. His grandfather was in “the war to end all wars,” World War I. His father fought in many of the South Pacific ferocious World War II battles as a marine, achieving the rank of Master Sergeant. Jeff also served in the U.S. Marine Corps from 1969 to 1972 during Vietnam. Part of his tour was in Japan. He completed the tour as a First Lieutenant. His son is a naval veteran. Jeff recalls his decision to have a Japanese bath, not knowing it was located 14 floors underground and was nothing like our American baths. He later retired from the U.S. Postal Service in Fargo, ND. He has a BS degree with a major in vocal music and a minor with German. He has sung solos in churches, other activities and with the Fargo Chorus. Both are on the government board of their church. 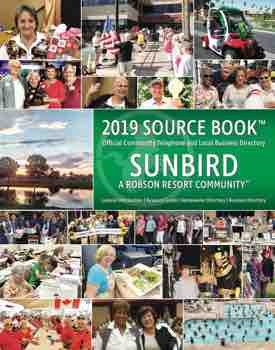 “After a number of visits to snowbird relatives and later renting, we purchased our SunBird house in 2015,” remarked Jeff. One serious hobby is scuba diving. Others are golf, cards, church choir and singing in the SunBird Singers. SunBird Community Church is very important, and God is evident in their lives. “I may have to stop giving Lynne golf lessons. She is getting better than I,” said Jeff. Travels involve scuba diving and Disney World in Florida, Mexico and exploring the desert.